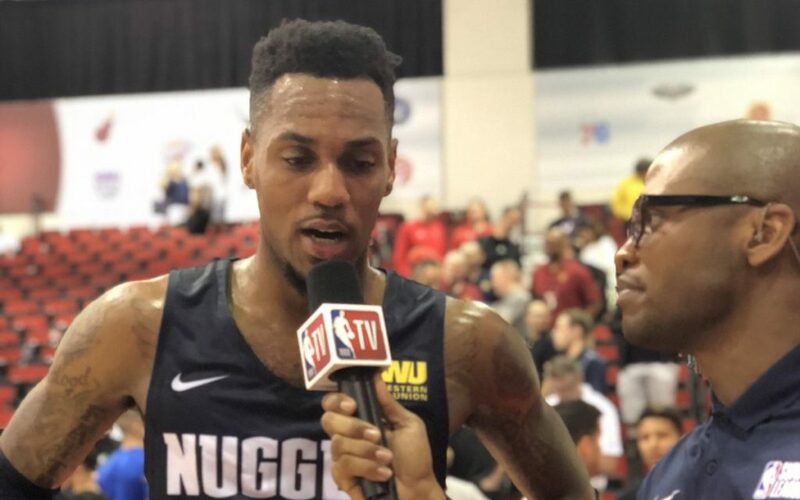 The Denver Nuggets Summer League team started on a high note Friday night as they held on to defeat the Minnesota Timberwolves 70-69. The Nuggets started guns blazing as they led 18-16 after the first quarter. Following a 6-0 run to start the game, Summer League veterans Malik Beasley and Monte Morris finished the first frame with six points a piece and shot a combined 5-9 from the field. Morris followed up his solid first quarter with an even better second as he finished the half with 13 points on 6-9 from the field. With the Nuggets having a 30-23 lead, Morris went on a personal 5-0 run to help stretch the Nuggets’ lead to double digits with 4:28 left in the half. Morris wasn’t the only star of the second quarter, though, as Vlatko Cancar made an instant impact off the bench. Cancar, the Nuggets second round pick last season, finished the half with nine points on 3-4 from the field. Cancar also added in four rebounds, with two of those coming on the offensive end of the floor. The Nuggets took a 40-32 lead into the half and immediately found a way to build off that lead at the start of the third quarter. A Beasley-to-Emmanuel Terry alley-oop set the tone as the Nuggets started the half on a 7-0 run. Highlighted by a 3-point jumper, Nuggets rookie Thomas Welsh ignited the Nuggets offense with five straight points and an assist for a Tyler Lydon 3. The Nuggets defense continuied to stand tall, as they allowed just nine third quarter points. At the center of the Nuggets defensive success was Kenrich Williams, who didn’t have eye-popping numbers, but affected the game defensively and on the boards. After taking a 62-41 lead into the fourth, the Timberwolves started the final frame on a 10-2 run and cut the Nuggets lead to 13. After a Morris driving layup to get the Nuggets offense going, the Timberwolves went on yet another run to cut the Nuggets lead to six with 2:48 to go in regulation. The defense rose to the occasion, though, and helped lead the Nuggets to victory in their Summer League opener. The stats leaders for the Nuggets were Morris, who finished the night with 15 points and four assists, Beasley, who finished with a line of 10 points, five rebounds and three assists, as well as Cancar, who finished with 11 points and four rebounds. The Denver Nuggets will be back in action tomorrow night to face the Boston Celtics. That game tips off at 9 p.m. MT.